Right click on images to download and save your photos! Feel free to share! Event is FULL at 500 participants! Wait list signup is at the bottom of this page. Join TriToFinishand Shorts Brewing Company in presenting the 3rdAnnual Snow Moon Trail Run! The Snow moon is a traditional name for the full moon that occurs in February in North America. This event has hearty trail runners embracing the snow and cold air temperatures with a unique race through the dark night with cool LED lights marking the path along with what might be the most festive “aid station” ever at a race! Runners embark on one of several race distance options - 5k, 15k or 25k - along a 5k loop of wide, groomed trails (not single track) through the woods of City Forest in Midland, Michigan. Those participants completing multiple laps (15k and 25k) will run through a chute located inside of the Snow Moon event tent where the finish line is located. After finishing, event Presenting Sponsor Shorts Brewing Company will be on hand with our partners from Midland Eagles 2110 providing icy cold adult refreshments! Added amenities for this year’s race include Shorts Beverages, Overall Masters Awards, Age Group Awards, and Event Pint Glasses for all participants! This is a USA Track & Field Sanctioned event. A portion of proceeds will benefit the Eagles of Midland 2110 and their community efforts. It is expected that all 500 registration spots will once again sell out - and possibly very early. Don’t be left out "in the cold" without a race this year! Register early! The Snow Moon Run will take place in Midland’s City Forest on wide-track cross country ski trails and mountain bike trails. The course will be marked with small LED lights to assist with trail navigation. The race is composed of a 5k trail course with runners able to choose a 1 (5k), 3 (15k), or 5 (25k) lap option. If you are opting for multiple laps, you’ll enjoy cheer from those in the tent as you run directly through a 3,200 square foot event tent. This race has one “aid” station with bonfire manned by enthusiastic volunteers that participants will pass twice on each loop of the course. Saturday, February 16th, 2019 from 3:00-6:00PM at the Eagles of Midland 2110 Post located approximately ¼ mile East of Midland City Forest’s Monroe Rd Entrance and site of Snow Moon Trail Run. Bring some extra cash! Shirts, hats, pint glasses, and other swag will be available for sale during packet pickup! 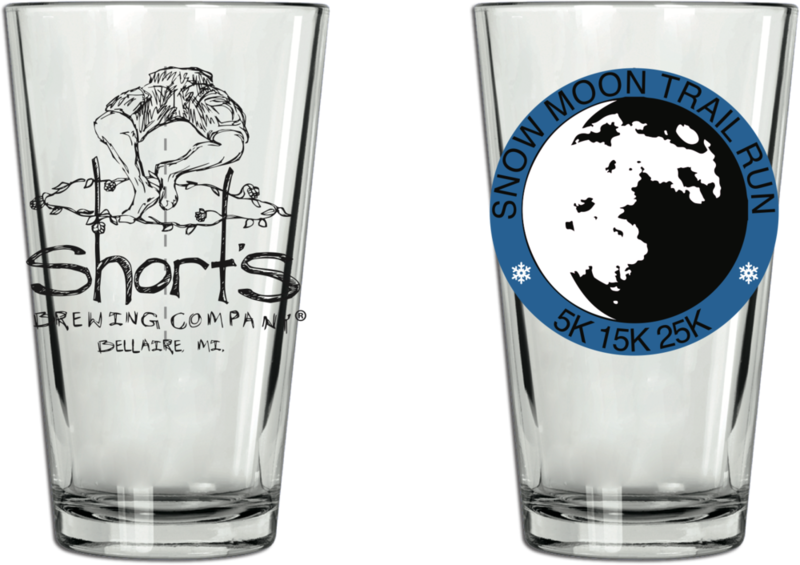 Included with registration, all participants at this event will receive a Snow Moon Trail Run pint glass, 2 Short’s beverages, custom Snow Moon finisher medal, FREE online finisher photo, custom race bib and professional chip timing. T-shirts, hoodies, and hats for this event are available at added cost and must be ordered by Monday, February 11th. Please read shirt descriptions. The t-shirt offering will be in Unisex AND Ladies Cut versions. Ladies! Please be aware that ladies cut shirts are SMALLER and more form fitting than the standard unisex shirts. Take that into account when ordering. See “Additional Purchases Available” section below for details on cost and sizing. To keep costs low to participants not interested in wearables, we are making shirts an “additional purchase”. Top Male & Female Finisher in each age group will receive an award this year! There will be limited parking at the Midland City Forest lot on race day. The Eagles of Midland will provide shuttle service in 15 passenger vans between the designated parking lots at the Eagles Club and Midland City Forest. Please be aware that there is about .25 miles distance between the packet pickup location and the event tent. We urge you to consider utilizing the shuttle service. It is free and the Eagles drivers are pretty good dudes. Both actual and adjusted results from Miller Race Management will be displayed at the event and will be posted at TRITOFINISH.COM within 48 hours of race completion. Interested in volunteering? Events like this can’t be successful without great volunteers! Sign up at the link at the top of this page and we’ll be in touch. All volunteers receive a cool, TriToFinish logo’d tech t-shirt courtesy of ATS Printing in Bay City, MI! What is the terrain like? Will I need traction for my shoes? It’s difficult to predict what the trail conditions will be like come race night. It is recommended that runners have access to high quality traction solutions for their shoes in case the course should be icy and slippery. Check out Korkers range of traction products that can be purchased locally at area Runners Athletic Company locations! How cold will it be in the event tent? We hope not cold at all! This year we are pumping heat into the tent. Prior to race time, Harless and Hugh Coffee from Bay City will be on hand with hot coffee and hot chocolate! Do I need a head lamp? We highly recommend head lamps so you can see where you are stepping. Trail races by nature require more attention to one’s footing. Snow and darkness increase the need to be more aware of your footing. Trails will be “marked” by small LED lights that do NOT provide ambient light and are intended only to help provide direction. Will the trail be lit or marked? The trail will not be lit. However, there will be LED lights and course markings to guide runners through the course. Will there be an aid/water station on the course? Yes. The course constricts for a bridge crossing at approximately the 1.5 mile mark. An aid station providing water and snacks of several sorts will be set up at sign 11 on the event map so that runners will pass by it twice for every 5k lap. Do I need special running shoes for this race? Not necessarily, though winter and/or trail specific shoes would help tremendously in keeping your footing on this course. We recommend you visit our friends/partners at Runners Athletic Stores in Midland, Saginaw, Bay City, and Mt Pleasant to find the best available options! Can I wear snowshoes for this race? Sure you can. Why the heck not. Can I wear cross-country skis for this race? No. Just… no. Can I walk or ruck instead of run? Absolutely. We ask that you sign up ONLY for the 1 Lap 5k or the 3 Lap 15k races and that you remain to the side of the trail and out of the path of runners if you choose to walk or ruck though. Will there be beer at the race? The Eagles of Midland will be serving up 2 brews from Presenting Sponsor Shorts Brewing Company to each participant as part of your registration offering. We are geeked about this! Race Director Andy has a fondness for Short’s Locals Light. We completely understand that plans change and athletes will sometimes be unable to compete in an event they've signed up for. Unfortunately, refunds will not be provided for any event unless the event is cancelled for reasons within our control. Dangerous weather, natural disasters, and local emergencies are examples of reasons an event may be cancelled that are NOT within our control. Should an athlete have an injury or other medical issue keeping them from competing in an event they've registered for, we would be happy to transfer their registration to a similar TriToFinish-owned event up to and including the same event the following season. A doctor's slip may be required as proof of injury or ailment. Failure to provide proof if requested will result in non-transfer of the event. Transferring registrations to other athletes is NOT allowed. *Sorry, Cancellation is no longer available. Registration is full! Sign up below to be placed on a wait list to replace runners who cancel. Thank you! We’ve got you on the list and will contact runners in the order they’ve signed up as spots become available. Once contacted, wait lister will have 24 hours to respond before the next person on the list is contacted.